Quantum pick racks provide a convenient high density, easy access, sloped shelving system, available as bench units, single and double sided free standing and mobile units. Pick Racks come with Quantum's durable plastic shelf bins and are available in a gray baked enamel finish which will not rust or corrode. 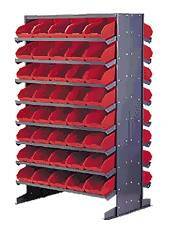 Sloped Shelf Pick Racks are great organizers for assembly operations or maintenance applications. The following units are pre-configured units with additional selections listed in the table. Has 8 shelves and holds up to 64 bins. 400 lb. capacity. Has 16 shelves and holds up to 80 bins. 800 lb. capacity. All Double Sided Units available as a mobile unit with addition of Mobile Kit. (Model No. QDU-00) 500 lb. capacity. 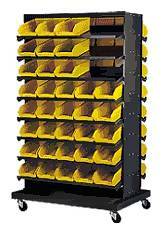 Twelve QSB 100, eight QSB 101, five QSB 102, four QSB 107, three QSB 109, six QUS 230 and three QUS 235 fit across a standard 36'' wide Pick Rack shelf.